To set the record, I was inspired by the creation of a novel tool to help individuals create daily habits through ElectroShock Therapy. OK, it's not as bad as I make it out to be, PavLok has created a wristband device that will alert/remind/punish users into accomplishing a set activity. It's an interesting idea, and prompted me to wonder if such a device or method could be utilized in helping to increase medication adherence - Minus the Shock of course. So, what I settled on was could it be possible to create a wrist mounted device that perhaps just either creates a chime or vibrates for the user, to remind them to take their medication? Perhaps it could be tapped (ala MisFit Shine) to snooze or accomplish other features as well. Going beyond that, to reconcile medication adherence, it could be possible to then use pill bottles to help with the process. Capitalizing on the idea of "the internet of things" and incorporating everything together, it may be possible to sync medications with adherence. Using RFID chips on the pill bottle, or even Bluetooth Trackers, could be incorporated into the pill bottle. Thus, the patient could tap the pill bottle against the medication reminder bracelet and then deactivate the alert. Lastly, all of this could be synced via an app that is accessible by the patient (or caregivers). This could allow the patient to document how they feel, especially with new medications, or track 'as needed' medications and whether the patient is well controlled (e.g. pain, asthma). Alerts could then be fed back via the app to the patient from providers or pharmacy, such as whether refills are available. This could also then be used to reinforce patient adherence by congratulations or reminders. Going further, it could have something similar to a feedback mechanism of the growing flower on the FitBit or a Happy face meter to demonstrate to the patient their adherence for the day and progress. I am a pharmacist and a huge proponent of interdisciplinary care, and as such I want to envision a day where pharmacy and providers really can work together for pharmacy care. One of the big ways is medication adherence. So, taking account of this design, I sought to identify ways in which each party can participate. 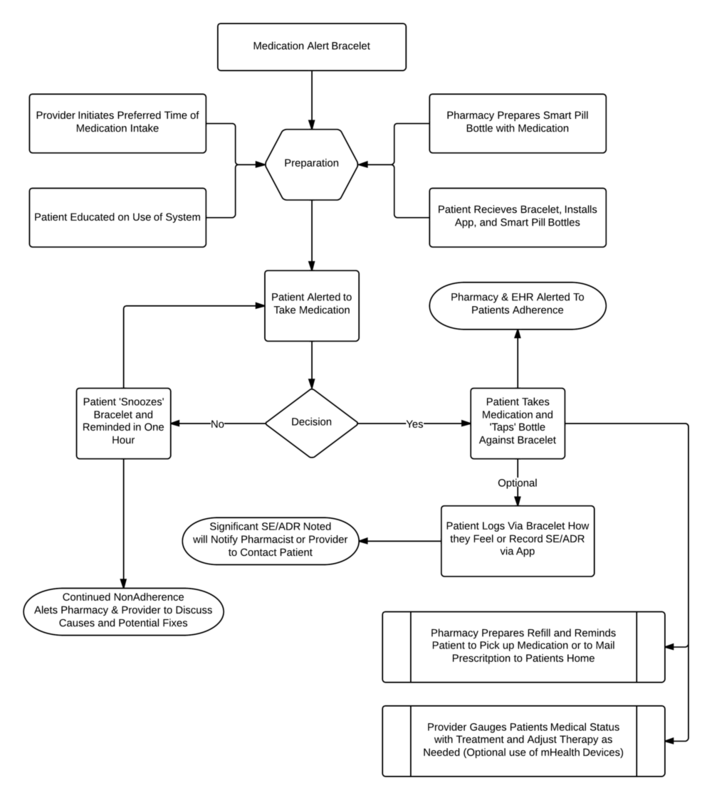 Proposed mechanism of a Medication Alert Bracelet for reminding patients to take medications. This aspect would incorporate the decision by the provider to determine the time that medication would be self-administered by the patient and communicate with the pharmacy what medications should be included in the overall program. Benefits of the idea would be that the provider would have the option to then see when patient is taking their medications (or missing) and allow them to delegate intervention through telemedicine or just a phone call. The pharmacy would be instrumental in the preparation of the medications and pill bottles with associated alert tags on them for the patient to receive. In addition, the pharmacy would then be able to track adherence, and could also intervene if requested by the provider, prior to their own intervention. Or the pharmacist could identify issues first and decide if the provider should be informed. The data would also be beneficial to then identify when refills are needed, and the patient could then be alerted via their app. Some areas are still rather grey that I am sure readers would easily pick out, and I welcome it, I think a social discourse of whether such technology is relevant or needed is always warranted, and may help others who may be lookigng into this. I feel one benefit would be that patients could feedback into the program how they are using their medications for symptom control. One could be pain management, which could show the provider their use and whether they need further help with management. What about medications that are not pills? This is the biggest barrier, how do we tackle products such as insulin? May be easy to slap a tag on a Solostar, but most pharmacies may be angsty with that, as we usually put the label on the package and not individual items, as it makes a large logistical barrier. This would be interesting to me. For example, lets say patient has hypertension (HTN) and is using another device to track bloop pressure. A new medication is started and then the information generated by their adherence and BP could be fed together to a provider or pharmacist to determine whether the medication is having any effect. This device could also be matched up with current other developments such as the bluetooth pill bottle AdhereTech. 64 Year Old Female with a past medical history of hypertension, hyperlipidemia, diabetes, coronary artery disease, and systolic heart failure. She has previously suffered a myocardial infarct and has several stents. She is being followed by the Heart Failure Clinic for her treatment, due to numerous readmissions concurrent to acute exacerbations of volume overload. It is noted that her numerous exacerbations are secondary to non-adherence to her diuretic and other all pharmacotherapy regimen. The patient is placed on this program, and the pharmacy and providers office work together to identify where adherence issues are present. Diuretic use can be tracked, along with other core medications for the treatment of Heart Failure. The provider or pharmacy can contact the patient with any identified times of non-adherence, in the hope of by increasing adherence, further readmissions can be prevented. Other mHealth tools can be utilized, such as a bluetooth scale that tracks patients weight, and can be used to measure volume status. Patient can also report back via app her status with volume and whether she is experiencing any symptoms (e.g. peripheral edema, shortness of breath). This data can also be used with the medication feedback to determine if further therapy is needed or if patient should come in sooner for a follow-up. I welcome thoughts, concerns, or recommendations on this idea.